Food is collected through local Churches and community organisations is the former Shire of Flinders, and also from bins marked “FOOD FOR ALL” in local supermarkets. Local schools also support Food for All by once a year arranging “Kick-in-a-Can” days. Food is purchased from three local supermarkets most especially when items are on “special” and an additional discount is granted by each supermarket. 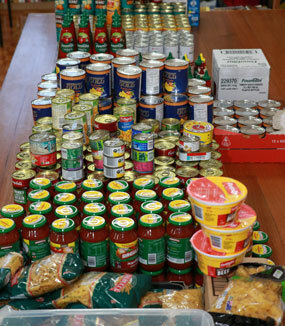 These purchases together with donated items enable balanced food parcels to be provided. An average of 80 food parcels are packed by around 20 eager volunteers every Thursday morning in at our Distribution Centre in the grounds of Our Lady of Fatima Church in Rosebud. Most parcels contain a packet of cereal, pasta, pasta sauce, long life milk, tea, biscuits, tinned fruit, soup, tinned meals, tinned vegetables, jam, rice cream, rice, etc. Fresh vegetables such as cauliflowers, carrots and broccoli are distributed with the parcels having been donated by suppliers, and apples are given fortnightly. 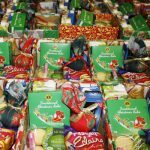 On referral the food parcels are distributed by members of the local Conferences of the Society of St. Vincent de Paul. These are given to struggling families and individuals within our community.